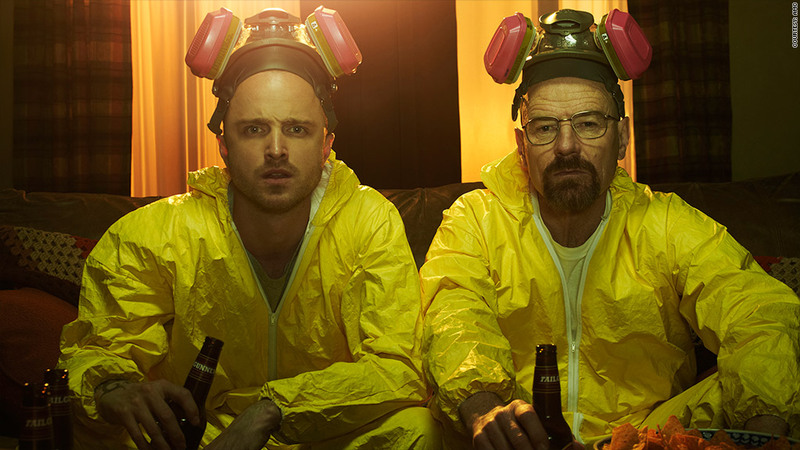 Walt's and Jesse's hazmat suit are being auctioned off along with other props from the show "Breaking Bad"
Lead character Walter White may have sold his rundown 2004 Pontiac Aztec for only $50 cash. But it'll cost a fan of "Breaking Bad "at least $1,000 to buy the car that has seen better days. The car, and hundreds of other props from the show, are set to be auctioned off online starting Sept. 29, the day the finale of the series about a dying teacher who turns to drug dealing is set to air. The 1989 Jeep Wagoneer driven by Walter's wife, Skyler, is also set to go on auction for a minimum $1,000 bid. The auction site Screen Bid warns it leaks oil and has some paint bubbles and chipping, and is being sold "as is." The RV in which Walt and sidekick Jesse Pinkman started their careers cooking crystal meth is not being listed for sale. The auction is set to run through Oct. 8. Other iconic items used on the show have even higher minimum bids, including $1,500 for Walt's hazmat suit, $3,500 for series villain Hector "Tio" Salamanca's bell, and $5,000 for his wheel chair. Other items have only a modest opening bid, including $10 each for the duffel bags Walt and Jesse used to carry around millions in cash, a DEA coffee mug and Vamonos Blue Coveralls. The show, which debuted in January 2008, has become a huge hit for the AMC Networks (AMCX) and Sony Pictures Television, the unit of Sony (SNE) that produced the episodes and owns the props. It has averaged 5.2 million viewers per episode so far in its final season, reaching a record 6.4 million viewers on the most recent episode Sunday night. That episode also inspired more than 600,000 tweets, according to Entertainment Weekly.